We have seen many different varieties of fitness apps, whether they are through phones, computers or devices (i.e. Amiigo Bracelet). Well now Reebok has got in on the action with their latest running feature Reebok Fitness. The idea of the app is brilliant, combining a calendar with a fitness routine, which allows you to choose the pace and frequency you work out at. 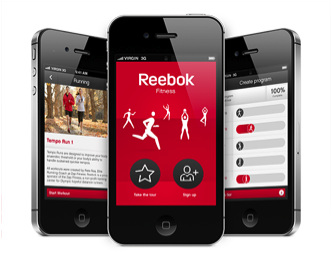 The groundwork of the app is a good idea as mentioned, however it seems Reebok have not fully taken advantage of their creativity. The calendar only allows you to track progress up to 12 weeks, which is great for a beginner, but what do they offer to the more experienced/dedicated users? Also there are only 5 categories, which you can participate in; walking, running, dance, yoga and training, all very brief as training could consist of many different variables, so there was hope still. However this was soon short lived, as the training routines are basically advanced stretches, they offer no exercises for muscle development training, however in their defence it does not promise to be a bodybuilding app. Another negative of the app is that you are expected to compete in at least two of the variables provided, which does not suit everyone as you may want to focus on one area of training, for example if your training for a marathon you will not want to waste a training day dancing or doing yoga. Once you have chosen your types of training the app will create a programme for you consisting over the period chosen by you at the start (6-12 weeks). This does not offer you progression stats though, merely the opportunity to share on social media sites and links to purchase Reebok products on your rest days. This app could be useful for someone starting out in fitness and doesn’t have the knowledge of what exercises are right to participate in, although overall it is not an impressive app, considering those already on the market.